NANCY L (1978) The new 38 foot aluminum gillnet troller Nancy L disappeared after leaving Anacortes, Washington for Craig with three persons aboard. Debris from the missing vessel was found below the cliffs of Calvert Island northwest of Victoria, British Columbia. Lost were skipper Clarence Freshour (40), his father Albert Freshour (68) and Bob Castleberry of Colorado. NAPOLEON (1885) The 306 ton American whaling bark Napoleon was lost in the spring of 1885 in the Bering Sea. She had recently departed San Francisco for the Arctic and was valued at $50,000 at the time of the disaster. The vessel was crushed in the ice and sank with little time to evacuate. 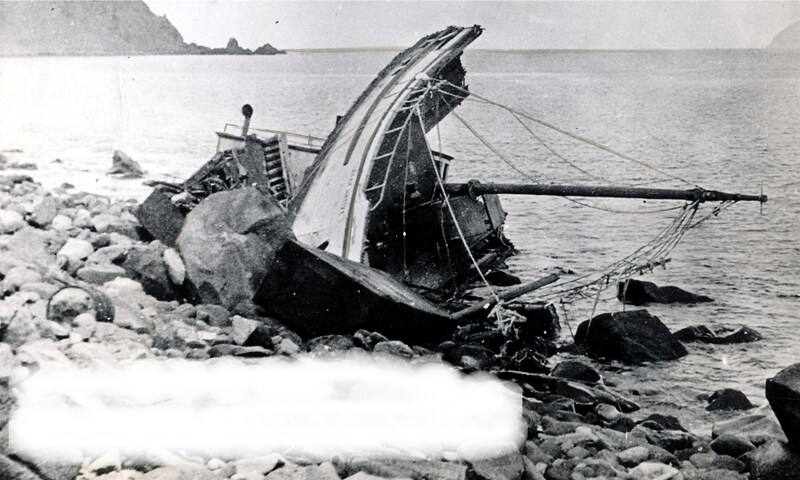 Four boats were lowered by davits as she sank and two of those small vessels went down with the ship. 18 crewmembers managed to board the two remaining boats and made their way away from the wreck. Of those only 9 survived to make landfall more than a month later on the Siberian Coast about 50 miles southwest of Cape Navarin. Two of those survivors died shortly after landfall. The remaining seven were attended to by local natives. Six died during the next 18 months of health problems mostly related to dietary and nutritional shortfalls. After two years, the sole survivor of the 18 shipwrecked whalers was James B. Vincent. Vincent was rescued by the U S Revenue Cutter Bear. The Bear had been dispatched to the area when reports of a long shipwrecked sailor circulated all the way to Alaska. NESIKA (2001) The fishing vessel Nesika was reported lost December 11, 2001. Lost with the vessel were captain Robert Thompson, Steven Langlot, Ben Eder and Jarid Hamrick. NICHOLAS (1880) The schooner Nicholas was driven ashore and became a total loss at Elainia Island April 6, 1880. Comment: The Sacramento Record Daily Union reported August 28, 1880 that this vessel was wrecked near Smith’s River. NO 1 (1898) The steel barge No 1 foundered at sea in Alaskan waters June 17, 1898. Her value at the time of the disaster was $17,000 with cargo. NOMAD (1897) The four masted schooner Nomad disappeared on a return trip from China along the Great Circle Route after leaving Shanghai December 7, 1897 for Seattle. She made her maiden voyage with a cargo of lumber out of Port Blakely in August of 1897 with a crew of 10 and one passenger. Lost with the Nomad were Captain John W. McAmep, the captain’s daughter Miss Helen McAmep, 1st Mate C.W. Soderstrom, 2nd Mate Charles Looman, Cook Fred Holmes, Carpenter Weston C. McAmep, Seaman George H. McAmep, Seaman R. Visentini, Seaman R. Thompson, Seaman G. Olsen and Cabin Boy L.E. Bloodgood. Comment: The tramp steamer Pelican disappeared shortly before the Nomad along the same route passing near the Aleutian Islands. Speculation at the time voiced the possibility of a connection between the two disappearances. An overturned wreck resembling the Nomad was spotted in June of 1898 245 miles west of Coos Bay Oregon. NOME (1900-1901) The 231 ton two masted schooner Nome was believed lost in Alaskan Waters between 1900 and 1901. NORTH BEACH (1970) The 75 foot wooden oil screw fishing vessel North Beach stranded and was lost at Spiz Reef February 8, 1970. NORTH WIND (1996) The 86 foot power scow North Wind grounded and sank September 2, 1996 in Fancy Cove. NOR-KAP (1922) The 15 ton wooden gas screw Nor-Kap caught fire on the gridiron in Triangle Bay and became a total loss July 7, 1922. The vessel, valued at $1,500 had not been run in over a month. The blaze was of unknown origin. The Nor-Kap had no insurance.